Almost exactly two years ago I bought a bat house kit from the Organization for Bat Conservation and after a fairly painless assembly and painting process attached it 15 feet up the trunk of a tall spruce tree about 20 feet from my house. I oriented the bat house to catch as much of the morning sun as possible and hoped that it would be a well received resource for the local bat community. April and May 2010, though came and went without any bats showing up at my house. And, that’s what happened in 2011, too. 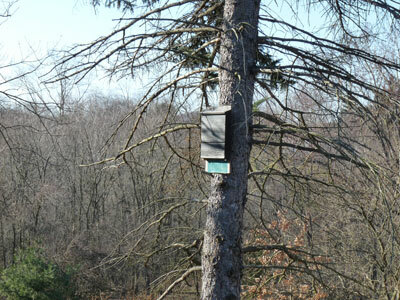 Both summers I heard bats flying past among my trees and over my deck through the early night hours gobbling up mosquitoes and other night-flying insects, but the bat house, for whatever reason, did not attract them. I was hoping for a colony of pregnant females to come and set up a nursery roost there. A lactating female will consume over 100% of its 5 to 14 gram body weight each night in insects. They can eat up to 600 insects per hour, and a million bats will eat, according to the Wisconsin Bat Monitoring Program, 694 tons of insects in a year! That’s a lot of mosquitoes that won’t be able to bite us! The bat I was hoping to welcome to my house is the little brown bat. This is the most common bat in Pennsylvania and has abundant hibernating sites nearby (caves and old coal mines). I have seen this species roosting under eaves of local outbuildings and up in the attics of several of our neighbors’ houses. One summer a small group of little brown bats (probably males) even utilized the narrow spaces of the picnic pavilion roof supports out by the Campus Nature Trail for their day roost. This species does not appear to be picky about choosing its roosts, except when it came to my bat house! The little brown bat and several other bat species have been the focus of some very unpleasant media coverage of late. The hibernation caves that they favor have become infected with a fungus called Geomyces destructans that causes a disease in the bats called white nose syndrome. This disease was first noticed in some hibernating bats in New York State in 2006. Since then the fungus and the syndrome has spread throughout the northeast. An estimated 6 million bats have died from this syndrome, and some colonies have had mortality rates of 100%. The fungus is thought to irritate the hibernating bat causing it to fitfully awaken from its low energy torpor too frequently through the hibernating period. This leads to a rapid loss of body fat, and the bat ends up starving to death. Infected bats even have been known to emerge from their protective hibernaculae during the winter and, thus, quickly die due to exposure to the cold. A few winters ago, Deborah and I saw a little brown bat up on the rocks over the creek along the Rock Furnace hiking trail. It was a sunny afternoon, and I thought at the time that the bat was possibly exploring a normal emergence from it hibernation caves. Now I know that it was probably infected with the white nose fungus. We need to do what we can to help our native bats withstand this disease. Recreational use of caves that have hibernating bats should be greatly restricted. Cavers have been shown to spread the white nose fungus on their boots and equipment, and many states and the federal government have enacted regulations to minimize this vector of transmission. So, the coming signs of spring include the sounds of bats consuming night insects. Hopefully, they will set up house on the side of my spruce tree, too! One Response to Bats on the Way! specifics given for a third person is remarkable. I enjoyed it thoroughly and will share in my network.